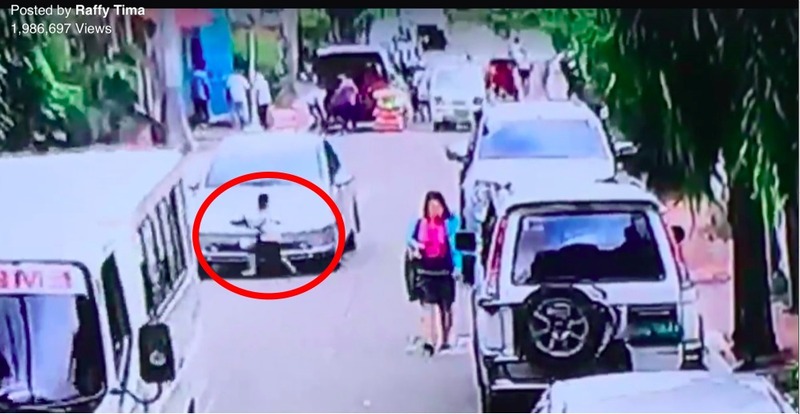 MANILA, Philippines - A disturbing footage showing a 5-year-old boy getting ran over by a car while crossing a street in Barangay Old Balara in Quezon City is making rounds on social media after journalist Raffy Tima shared it on his Fabook page on Friday, August 12. The incident, which was captured by a CCTV camera, shows the young boy identified as Mark Nathan playing along the street unsupervised. He was on his way home when he suddenly crossed the street and got ran over by a car being driven by Engineer Rene Gutierrez. Upon realizing he ran over something, Gutierrez immediately stopped his car and went out to check what he hit. A panicked Gutierrez ran away from his car and surrendered himself to a nearby barangay outpost after seeing Mark Nathan. Seeing what happened, several people in the community worked together to rescue Mark Nathan who was stuck underneath the car. The boy luckily survived the ordeal and was eventually rushed to a hospital where he received treatment for bruises on his face. Mark Nathan will be subjected to further medical tests to ensure that he did not sustain any internal injury. Gutierrez, who visited the hospital where Mark Nathan was rushed, promised to pay for the medical expenses incurred due to the accident. Apparently, Gutierrez was a former co-worker of Mark Nathan’s grandfather. Netizens noted that Gutierrez was not at fault since he was driving at a moderate speed. Furthermore, they said the parents of Mark Nathan are to be blamed since they left him unsupervised when the incident happened. Others pointed out that illegally parked cards along the street may have contributed to the accident. The video has over 1.9 million views and 17,000 shares as of press time.